In Why The Kalenjin Should Not Be Misled By Ruto published in the Star today, I examine the relationship between Uhuru Kenyatta and William Ruto and offers reasons and analysis why the Kalenjin should not be misled by the duo into believing their relationship and working together has the communities interests in mind. The first question that came to mind to many after Uhuru Kenyatta and William Ruto first indicated a willingness to work together, was why would the two men accused of being responsible for their respective communities basically butchering each other would want to work together. On the surface, the only thing that came to mind to many, were here were two individuals circumstances had developed such that they were either hanged together or hanged separately; there was no loss in that sense for them to forge a relationship whose benefit could be a net plus as opposed to not working together and therefore being hanged separately, anyway, if it came to that. As events evolved, however, and especially after the confirmation of charges against the two and their other ICC accused, keen observers started putting two and two together and a clear picture started to emerge what was really going on. This in particular during and immediately after the so-called “prayer rallies” which in reality were nothing even close to a religious event. It must be noted at the time, both Uhuru and Ruto were individually presenting themselves as presidential candidates albeit in the so-called G7. What emerged then as a strategy, was that even as Uhuru and Ruto were appearing to work toward a run for the presidency with one emerging as the flag-bearer depending on how the G7 group was inclined, Uhuru was actually already carrying himself as the presumptive nominee no matter what the entity under which he vied and sought the nomination. Meanwhile, the Mudavadi project for ABR (Anyone But Raila) was underway. There is little doubt in hindsight for many, and in real time and before for the most astute that both Uhuru and Ruto did not see Mudavadi, weak and indecisive he is, as capable of being the project he was meant to be. Uhuru having been a project previously, had some experience to go with and obviously shared with his now protégé Ruto. That being the case, the duo continued on their separate yet joined presidential quests, even as there was wrangling within the G7 group they belonged which ultimately collapsed on the weight of its indirection. Curiosity intensified several months later on November 27, 2012 when Uhuru and Ruto announced to the world that they’ll be teaming up to vie for the presidency and vice presidency. There was little doubt in anyone’s mind who in that scenario will be the flag-bearer and who will play second fiddle. 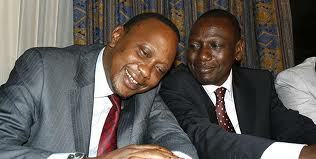 No one in their right mind would have thought even for a second that Uhuru would play second fiddle to Ruto. This was confirmed on December 2, 2013 when the duo announced the formation of Jubilee alliance in which Uhuru was made the flag bearer and Ruto made his side-kick with an a MOU not worth the paper it’s written whereby Uhuru (read Kikuyus) and Ruto (read Kales) will share power on a 50-50 basis. Never mind what the rest of the communities will share in that power arrangement. Upon what Uhuru said was a visit from the devil, Mudavadi was briefly brought into the equation as the flag-bearer of the Jubilee alliance but given only a promise of power sharing less than the ICC indictees had agreed to dole to him in making him their project. It’ll take a book to analyze how naïve Mudavadi was in reaching such a deal but, not worth it as he has proven over and over when it comes to these things, he is more than naïve happy only to be a project to whoever entices him the most and most recently the ICC indictees were the leading candidates for that effortless feat. Which leads to a key question: We know the crams Mudavadi was promised to join Jubilee; but what was Uhuru’s promise to Ruto to agree to not only join him, but to play second fiddle? The answer must lie in the underlying issue that belies the ICC cases against Uhuru and Ruto and that’s land. Uhuru being the son of our first president Mzee Jomo Kenyatta, and notwithstanding the rap against him as not being that smart when it comes to politics must have been advised a band aid was put over the land issue in Rift Valley in the 60s and 70s by appointing Daniel Toroitich Arap Moi, a Kale, as Vice President. As long as he served in that position, all land issues in the region were relegated to the back-burner. Uhuru must have had the same strategy in mind and sold it to Ruto, essentially telling Ruto, I’ll make you deputy president and as president, I will return the lands taken away and give those most affected land elsewhere not even near Kaleland. This is an offer Ruto could not refuse because, for one, it’ll be easy to sell in the area and secondly, it would put him in Deputy President much more easily—according to their calculation, than, say collaborating with Raila. It remains to be seen whether such a deal will ultimately work but, going by what we know already about Uhuru, keeping promises even when reduced to writing is not something he’s fond of. Much as Uhuru discarded the MOU with Mudavadi, so too will he discard any deal he has made with Ruto. This is an important fact our brothers and sisters from Rift Valley must understand for it’s as true as the sun rising from the east and setting on the west. Much as Uhuru is experienced as a project himself—something he used to Mudavadi’s disadvantage when he duped the latter to sign a useless MOU, Uhuru need not look further than his own father who used and dumbed Jaramogi when it was convenient to do so. One must give Mzee Jomo credit for maintaining to the end Jaramogi was his friend and even said as much in Kisumu during the infamous incident when Kenyatta was pelted with stones and declared he would have had Jaramogi arrested but for the friendship. When it came to his turn, Kibaki shred to pieces his MOU with Raila after the 2002 elections, setting in motion events which have still to conclude until after the next general elections on March 4, 2013. It’ll be Uhuru’s turn to shred any MOU with Ruto and by this history, one has to be in absolute total denial not to believe or see it coming. First, if Uhuru were honest on this deal, he would have supported Ruto for president and let Ruto do the bidding for this type of land resettlement scheme, if it was a genuine one intended to address the land issue in Rift Valley. Second, given it’s obvious the deal between Uhuru and Ruto had nothing to do with resolving the historic land issues affecting the two communities they each represent, the next logical and only conclusion one must reach is the deal has to and must do with the individual interests of the duo in connection with their ICC cases. More specifically, the deal has to do with the two believing by working together and in the unlikely event they are elected, they can thwart or altogether defy the ICC. A lot has been written about what consequences will befall our country were this to turn out to be the case, namely, the duo is elected and they choose to thwart or altogether defy the ICC. One thing can be said for certain, given their inevitable thinking: they could care less what the consequences are for they believe they can weather the storm. After all, they’re individually well cushioned financially and were there to be any seepage of finances for the less well monied, the other one will bail him out. It’s a no brainer who pays the dear price for that and that’s the ordinary Kenyan who will suffer even more than they have in the past. Third, besides the land issue, if those pulling the strings for Uhuru, and that’s not to say he’s not his own man, if they wanted to help the Kalenjin community, they would have revived KCC, KPA or written off farmers’ loans from ADC and AFC. They did none of that, which is telling in by itself what to expect were this deal to hold and surprisingly put the Uhuru Ruto duo in high office. Instead, they wrote off loans for coffee farmers and not even pyrethrum farmers whose loans were given under similar conditions and for the same purpose. Finally, but not least, all one has to ask themselves is, why has Eldoret airport not been made fully functional? We need a president who has to address issues affecting all Kenyans both ordinary and elite and that person is not Uhuru Kenyatta; at least not based on these facts. CORDoms have made stupid assinine assumptions after the other. First,ICC stigma was assumed to be. Be the death knell for Uhuruto. FAIL. Then Kikuyus can’t work with Kalenjins,that Ruto would never work with UK. FAIL. Finally,when it became apparent that Jubilee had it in the bag,propaganda flew. First Sanctions,Rigging,’historical injustices’,Chapter 6,Mutunga threats,Ruto’s ‘Final Solution’. Of course this author is working the last angle,that Ruto will be fixed probably hoping to dissuade Kales against UK. Fact is RAO fixed Kipsigis by awarding them 1 cabinet position against the Nandi’s 4 yet the brought more votes. Also he denied their son DPM post in favor of a small contributor-madvdm point is juvenile minds keep on spinning yarns about PROBABLE Ruto fix,whereas,RAO ACTUALLY fixed him! They are not that dumb,that’s why he is booed.